MURDERED Belfast community worker Ian Ogle died with “unparalleled bravery” while protecting those he thought were in danger, his funeral has heard. The 45-year-old died after he was attacked and stabbed 11 times as he prayed with a pastor on a street in the east of the city last Sunday. More than 1,000 mourners, including members of East Belfast Protestant Boys Flute Band, of which Mr Ogle was a member, lined the streets outside his home on Cluan Place, just yards from where he was attacked and left to die. 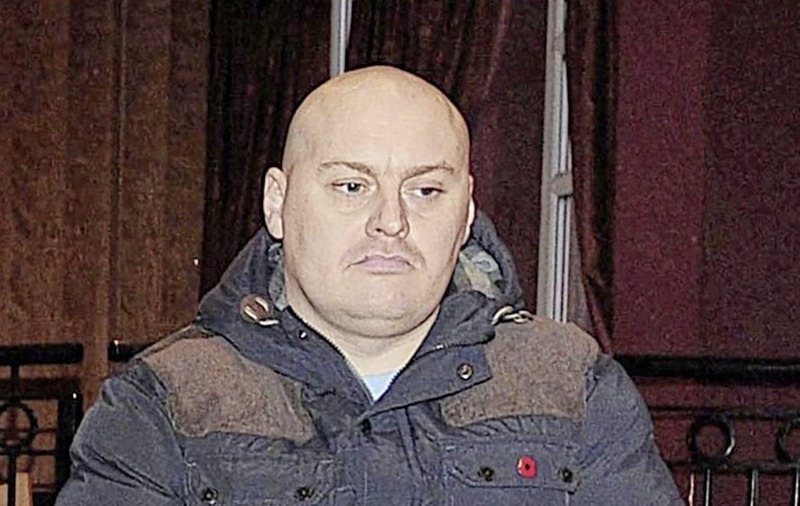 There has been speculation that people associated with the UVF were responsible for the killing. 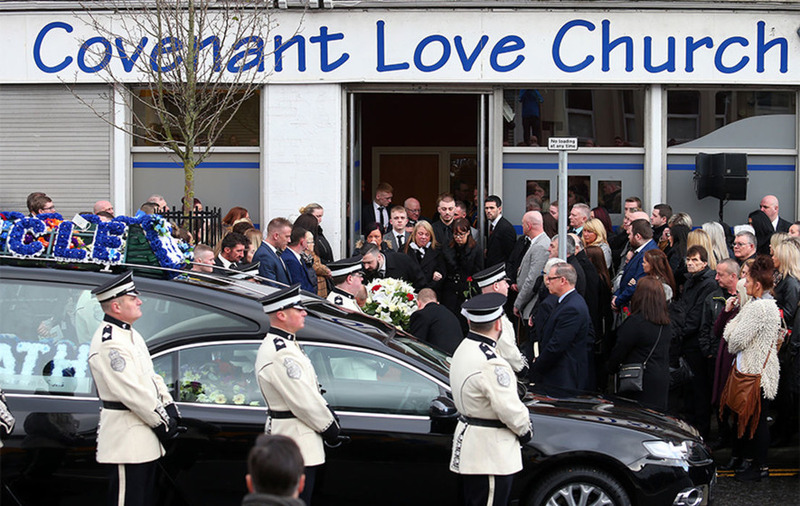 His funeral at Covenant Love Church on the Albertbridge Road heard how the father-of-two died with his son, Ryan, next to him. Pastor Kevin Sambrook, who prayed with Ian moments before his death, described the tragic scene. “He valued the lives of those he felt he needed to protect more than his own. “I have known Ian for many years, he was a good friend to the church and to me and I often stopped to chat with him. “On the night he was murdered, I had been walking round from the church when I met Ian at the top of Cluan Place. I stopped, shook his hand and we began to talk. The funeral heard that Ian Ogle had shown ‘unparalleled bravery’. Picture by Mal McCann. “Moments before the attack he reminisced about his Granny who was a strong Christian woman and he said how she would say ‘you have got to turn the other cheek’. “Ian met his end with unparalleled bravery and died protecting those he believed to be danger without a second thought for his own safety. “Ian willingly gave his life for others while others willingly took it from him. “What I witnessed that night will stay with me for the rest of my life but my strongest and most abiding memory will be not of Ian’s murderers, but rather this brave and selfless man displaying supreme courage with a heart of a lion meeting lethal danger head on knowing he never stood a chance, but content to fulfil an obligation to protect others. He also described how Ian had moved away from his past and had turned to God towards the end of his life. He added: “We may be tempted to ask, what good can come out of this senseless act of barbarity, yet we must believe Ian did not die in vain. “A community united in grief, desperate for justice, and brave enough to demand nothing less than change where fear and intimidation no longer remains. The biggest tribute we can pay to Ian is for his death to become that catalyst for that change beginning now. The funeral took place as detectives probing the murder made fresh arrests. Two men, one aged 40 and another aged 37, were detained today by detectives investigating the murder, bringing the total number of people arrested to 11. Mr Ogle’s daughter, Toni Johnston Ogle, joked how she had not prepared a written tribute to her father because one of the qualities he gave her was her ability to “talk the leg off a stool”. “I’m not going to say too much but what did Hitler say to his men to get them into their tanks? ‘Men, get into your tanks’,” she said. Davy Ralston, a community pastor and close family friend, said: “He was a friend to all with a heart of pure gold. DUP MP Gavin Robinson was among those attending the funeral.